Sydney Hunter, the great adventurer, found him self a new mystery to be solved. In the upcoming title "The Sacred Tribe", his will to survive is stronger than before. This new platform game is about to be released for MSX by independent game developer CollectorVision Games. It comes as a boxed cartridge with printed manual. CollectorVision Games is an independent game developer, publisher & manufacturer since 2008. They create games for retro consoles and computers, and with the release of Sydney Hunter and The Sacred Tribe they add yet another great title to their conto. 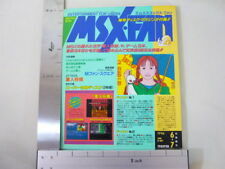 It is their first MSX release. Sydney Hunter is a new retro-style adventure/puzzle platformer. Armed only with his trusty boomerang, Sydney must navigate dark caverns while avoiding bats, ghosts, hot lava and other obstacles. The Sacred Tribe is the second game in the Sydney Hunter series. Already announced two years ago, Sydney Hunter & The Caverns of Death is still in development. 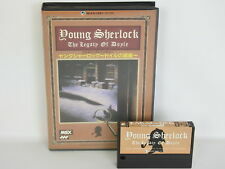 The game development has finished and will soon be release on cartridge complete in box with a manual. Pre-order your copy at the CollectorVision HQ. Shipping is planned for July this year. Montana John anyone? Anyway, looks like a cool game! For what i know, the game in development for MSX is "Sidney Hunter & the caverns of death"
"Sidney Hunter & Sacred Tribe" is for IntelliVision. That was my early conclusion, but it seems SacredTribe is the one to be released for MSX. Caverns for retro consoles has been abandoned in favor of modern consoles. I asked the source directly. But I agree, this release lacks concrete MSX context information. In april, I asked via email to CollectorVision about "Sidney Hunter & the caverns of death", and Toby (CollectorVision) replied me that the game is still in development for msx and will be completed between july and august. This is clearly marked as an Intellivision game on the site, and the site doesn't even have a section for MSX games. I think this news article should be removed until some sort of concrete confirmation is received from the developers as to what's what here, and their website is updated accordingly. As it stands, I believe the news may have broken too early. Hi. I'm the author of Sydney Hunter and the Sacred Tribe, I can confirm the MSX version is already tested and complete. It will be out after the Colecovision version because Collectorvision is designing their own cartridge PCB . They will distribute the game themselves. The Intellivision version was finished last year and sold out completely also a new edition is underway. Nice to see that cross platform development! 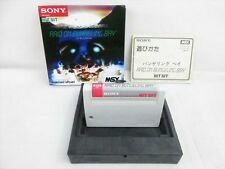 So does that mean the preorder link in the news article is for the MSX version of the game after all, even though an Intellivision box is pictured? Or are MSX preorders coming later? So will be released for MSX both "Sidney Hunter & the caverns of death" and "Sidney Hunter & Sacred Tribe"? I'm not sure why but the pictures showed in the main title are from the Intellivision version and the link is for the Colecovision version. I'll ask J-F to put a link to MSX version or some clarifications about publishing time.